Rome is a theatrical place. 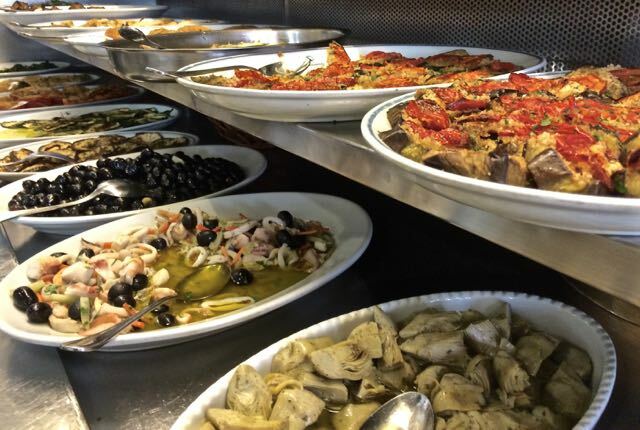 Going out to eat in Rome is a lot like going to the theater. It is all a performance. There are sets and acts and intermission. Sometimes you want a grand show with costumes and choreography and sometimes you want a simple story on a small stage. The other day I was walking home from yoga, feeling very healthy since I had exercised after an indulgent weekend and I looked up from my green juice to see a friend I had made over said indulgent weekend. 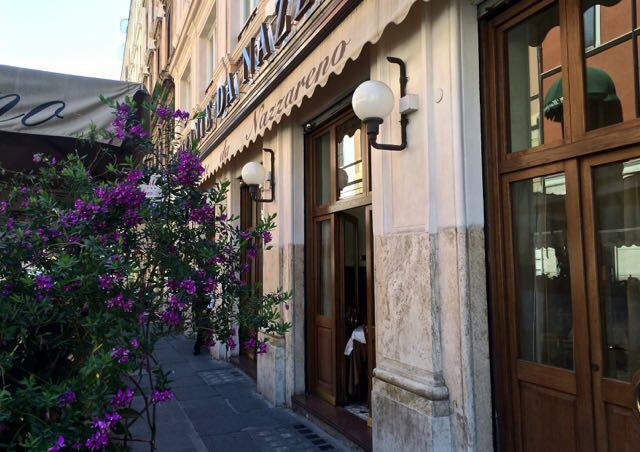 Rolando was on his way to his favorite Trattoria in Rome and insisted I join him. 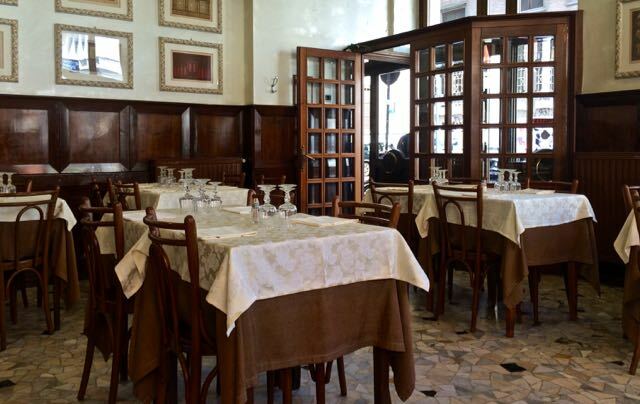 I can't say no to a plate of amatriciana so I turned right back around and found myself at Ristorante da Nazzareno. 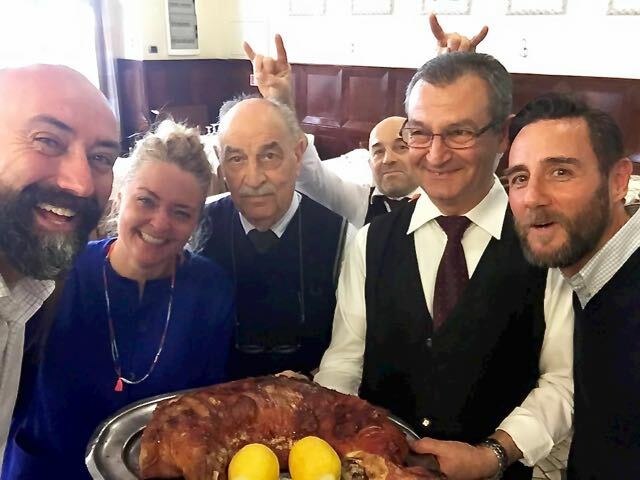 Rolando was greeted like a returning family member with generous hugs and kisses and we were ushered into the polished wood-paneled dining room and brought Aqua di Nepi and a bottle of white from the nearby Castelli. 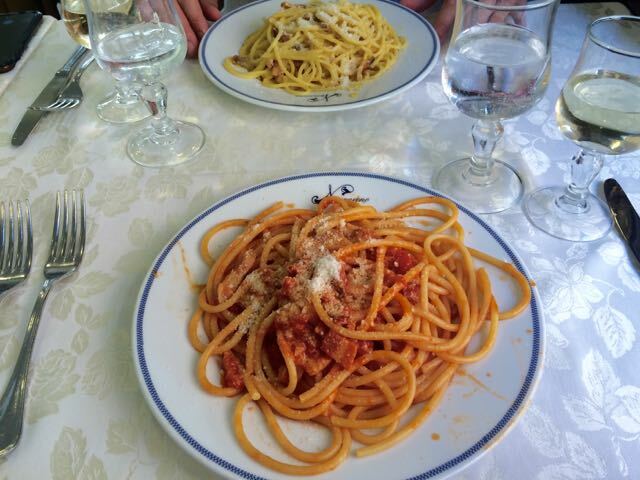 We ordered spaghetti alla carbonara and bucatini amatriciana and caught up on political gossip and where to find the best barber in Rome. When Nonno thought I was eating too slowly I was gently scolded to stop talking and eat my pasta. 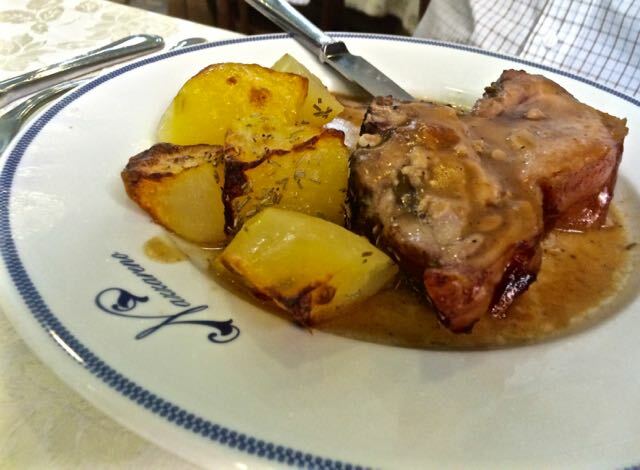 I spotted a delicious looking maialino and so a small (ish) portion of that was brought with roast potatoes and slathered in gravy. True comfort food. Dessert was a slice that is a closely guarded secret that is part biscuit crust, part creme caramel with rum soaked raisins, part chocolate. You can have the recipe if you buy the restaurant. 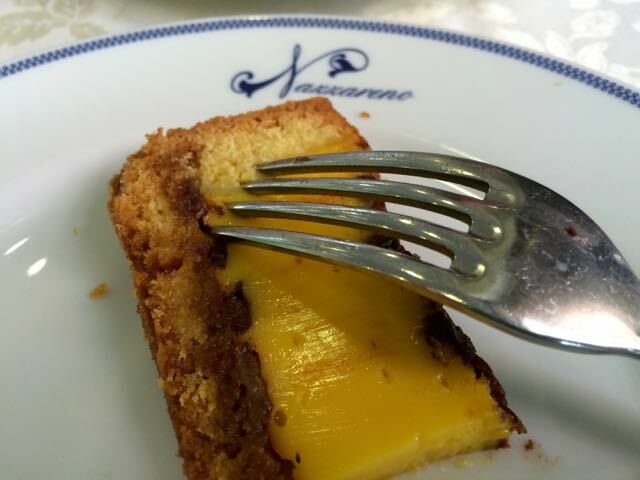 da Nazzareno is just behind Termini station and is one of those Roman restaurants people are always talking about wanting to experience. 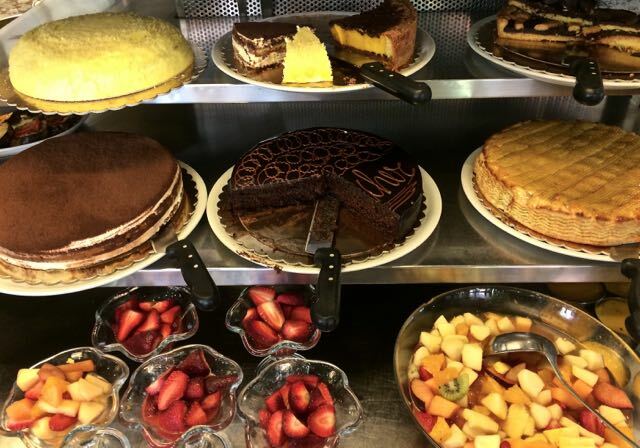 Old fashioned, family run, traditional food; Check, check and check. Hi! I was wondering if you could recommend any yoga studios (preferably ones that have hot hatha yoga) in Rome (or Italy in general) or if you have a blog post on this? Thanks a million! P.s. I know this is a little off topic of this post, but since you mentioned it... I thought you must have some advices! I practice at Ryoga www.ryoga.com They have 2 studios one not far from Termini and another in Trastevere (and there is a new one about to open in Prati.) There is every kind of practice to choose from in both English and Italian.